With its large size and variety of year-round offerings, it’s no surprise that Great Smoky Mountains National Park is the United States’ most visited National Park, with over double the number of annual visitors that the second most popular National Park, Grand Canyon National Park, sees. This post provides a guide to Great Smoky Mountains National Park, with 5 of my favorite things to do in America’s most popular National Park. While I’ve visited Great Smoky Mountains National Park a number of times from childhood to adulthood, an important caveat to this guide is that I’m not a local (it’s about an 8 hour drive from us), nor do I have intimate knowledge of the park. As such, this shouldn’t be viewed as an exhaustive guide. I have done a lot of things in Great Smoky Mountains National Park (and along the Blue Ridge Parkway), but I definitely have not seen it all. Especially the trails–I’ve only explored a small fraction of them. Unfortunately, there are no great guidebooks for the Smokies. The best we’ve found is the now out-of-print Fodor’s (less than $1 on Amazon! ), which you should definitely pick up. Stay away from the newer ones like Moon’s, as they’re all under 100 pages long and not even close to comprehensive. The only other relatively good book is NatGeo’s Trails Illustrated, and that’s geared towards hikers. Instead, look to other websites. The best I’ve found is VisitSmokies.org. For photography, I also like the book Photographing the Great Smoky Mountains. I was hesitant to buy this book because of negative reviews, but I think it’s great. The photos in it leave something to be desired (which is the basis of some negative reviews, I suppose), but the location and time tips are invaluable. The book is organized in such a manner that it’s easy to find the locations, which is an issue with other books as typically these things are written by locals who are familiar with the parks and take for granted that their readers don’t have the same familiarity as them. With that caveat out of the way, let’s take a look at some of my top 5 picks for things to do in Great Smoky Mountains National Park. Mingus Mill is near the Cherokee border of the park (a town that itself is worth driving through for its somewhat shocking and offensive caricatures of Native Americans), and it’s an easy stop near the Oconaluftee Visitor’s Center. Mingus Mill is a historic grist mill that was originally built in 1886–restored by the National Park Service in 1968–that uses a water-powered turbine instead of a water wheel to power the machinery in the building. According to the volunteers in the building, this is an impressive feat, and it’s doubly impressive that the building has stood for so long. The inside of Mingus Mill is interesting enough, and even though it’s two levels, it’s relatively small and can be quickly explored. The volunteers inside are eager to chat with guests and tell the rich history of the Mill, and it’s definitely worth chatting with them for a bit. What I like most about this area is the walk along the mill-race (directly behind the above photo) that leads to the mill. It’s a beautiful area and a nice, short walk. Here’s some more info about Mingus Mill. 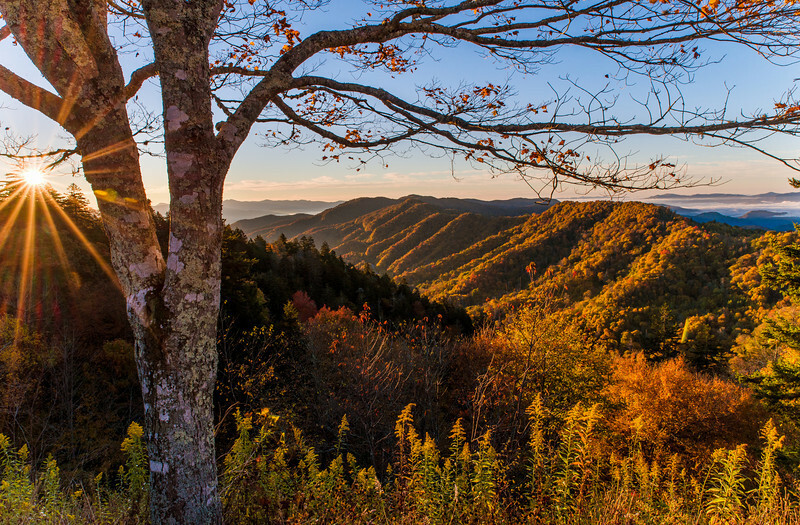 If you’re visiting Great Smoky Mountains National Park, there’s a good chance that you’ll be driving along Newfound Gap Road, which is the highway that runs through the park from Tennessee to North Carolina. It’s a beautiful drive with plenty of pull-offs along the way, which you should use liberally. There are significant changes in elevation over the course of this road, and the variety of trees and wildlife that can be spotted is pretty significant. My favorite of these two pull-offs are Newfound Gap and Oconaluftee Valley Overlook. Both are great spots to watch the sunrise, but my preference for that goes to Oconaluftee Valley Overlook (see top photo in this post). Newfound Gap also contains the Rockefeller Memorial, and a great view of the mountains below. Our other must-stop recommendation is the Chimney Tops overlook. 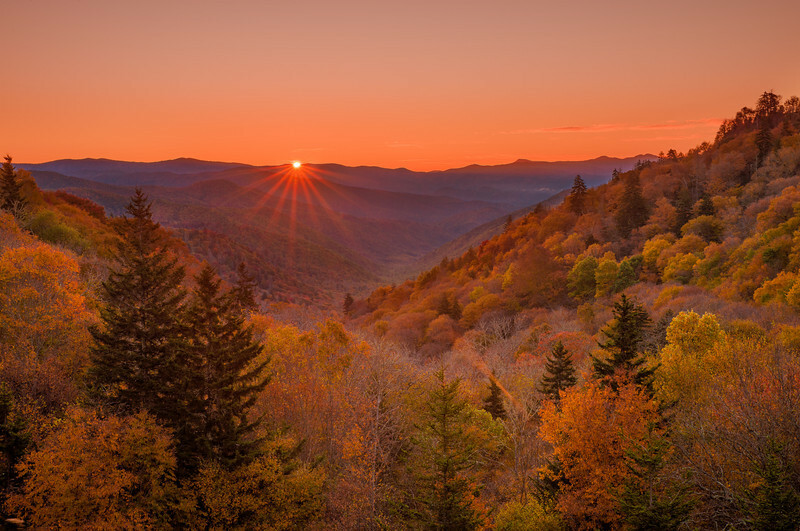 My tip would be to start at Oconaluftee Valley Overlook at sunrise one day, and make your way to Cherokee during the course of the day, with sunset along the Blue Ridge Parkway (outside of the park) somewhere near Waterrock Knob or Yellow Face Overlook, depending upon the sun’s position. On the state line between Tennessee and North Carolina and rising 6,643 feet, Clingmans Dome is an observation tower on Great Smoky Mountains National Park’s highest point. 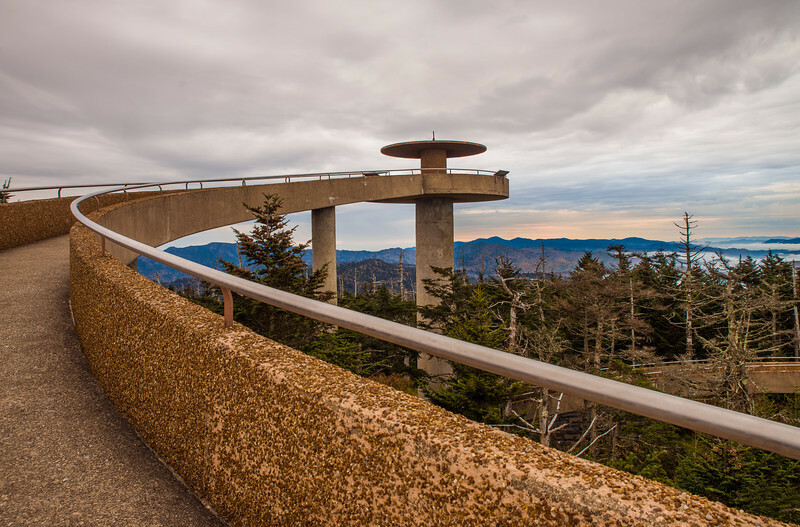 The observation tower on the summit of Clingmans Dome is about a half-mile hike from the Clingmans Dome parking lot, and it’s a sight in itself, offering 360° views of the Smokies and beyond. On clear days you can see 100 miles from Clingmans Dome, into 7 nearby states. Air pollution and clouds (you’re often above them but are sometimes “in” them) often limits viewing distances to under 20 miles. If you’re willing to get up early, it’s worth heading up to Clingmans Dome for the sunrise–it’s absolutely breathtaking from up there! This is the most iconic spot in the park, and it gets really busy during the day, so I recommend going as early or as late as possible. The benefit to going early is the sunrise (don’t discount the parking area as a sunrise spot–I’ve encountered better views from there than from the observation tower), while the benefit to the night can be few, if any, other visitors and a view of the clear night sky with lower-level clouds forming below you. The downside to both is that you have to put up with colder temperatures in the early morning or at night, but it’s well worth it to avoid those crowds and for the superior view. Cades Cove is a large valley surrounded by mountains that was once home to Native Americans and, subsequently, a group of settlers somewhat isolated from the outside world. 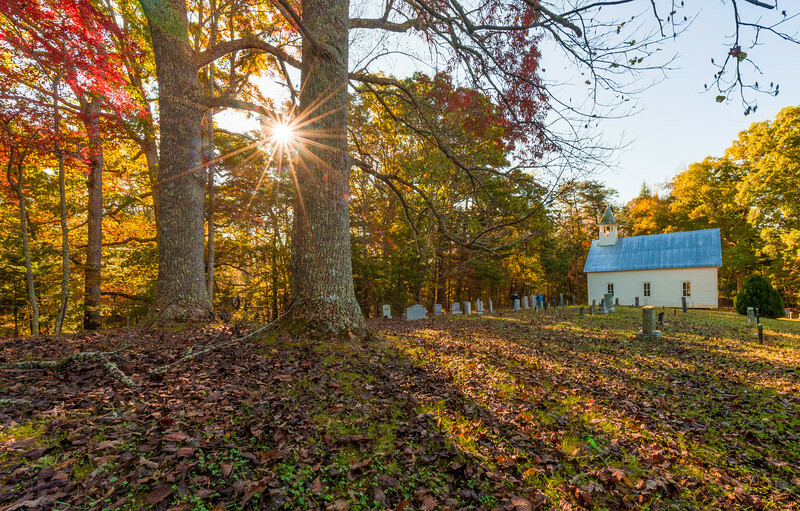 This popular area in Great Smoky Mountains National Park that features a number of preserved 19th-century homesteads and churches along an 11-mile one-way loop that includes a visitors center and a variety of other trails radiating out from it. It’s also an easy spot to find a variety of wildlife, ranging from deer to black bears. I think Cades Cove is really fascinating. On its face, it’s just this area with a bunch of primitive buildings and churches. Beyond just the superficial structures, there’s the backstory of the significant ‘war’ between the people of Cades Cove and the National Parks Service as Great Smoky Mountains National Park was being established in the early 1900s. To put it succinctly, the primitive (I think that’s more than a fair word to use here…) people of Cades Cove did not want their ways disturbed, and presented numerous obstacles to their land being incorporated into the National Park. (In fairness, the National Park Service wasn’t totally innocent here.) As you drive and walk through these places, it’s interesting to think of the life these people lived and the struggle for their way of life that played out less than 100 years ago. Personally, I think it’s a much more interesting area to see if you come in with an understanding of its history. As for touring tips, I highly recommend getting to Cades Cove as early in the morning as possible–just after sunrise. Traffic backs up here as many visitors like to stop and photograph things out of their car windows as opposed to using the pull-offs and actually really looking at things. Because of this, the 11-mile loop can take an upwards of 3 hours to complete (with no stops) if you visit during prime season and the middle of the day. You’re also less likely to encounter wildlife during the middle of the day. I also recommend actually pulling off and actually looking at the primitive buildings, horses, deer, and other wildlife you might encounter back here. I’m a firm believer that National Parks are meant to be experienced, not driven through. Accordingly, whenever I go to any National Park, I make sure to do at least one hike. Usually more. With limited exceptions, I recommend everyone do the same. I’d describe Alum Cave Trail as a ‘moderate’ trail, with a 4.4 mile round-trip duration. Out of the trails I’ve done, I recommend this as opposed to others because of its variety. It offers walks over rivers and streams, a beautiful overlook at Inspiration Point, a fun climb under (through?) rock at Arch Rock, and finally the awesome Arch Cave bluff. In other words, there’s a lot of visual interest along the way, and it’s not just a series of outlooks over trees, as is the case with some other trails in Great Smoky Mountains National Park. In fairness, I haven’t done every trail in Great Smoky Mountains National Park (far from it), but of what I have done, this is far and away my favorite. It’s a popular trail, so I recommend arriving early to beat the crowds. 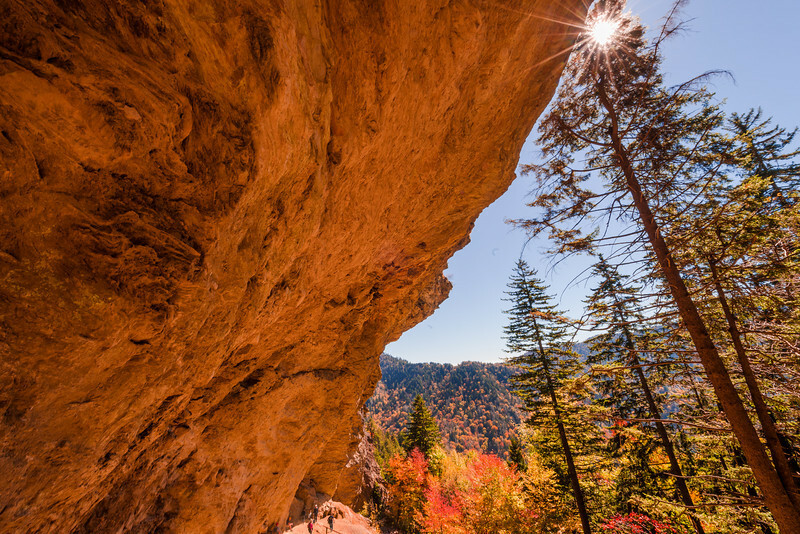 You can read more information about Alum Cave Trail on this hiking guide page. That covers it for our top 5 spots in Great Smoky Mountains National Park. Of course, there are far more than 5 spots worth seeing, and you could reasonably spend a week or longer (I think the ideal amount of time is 3 days for anyone who wants a good taste of the park, but isn’t a completionist), so obviously there are far more than 5 things worth doing in the park. In general, there’s a lot of ‘go early’ advice here. Photographers reading this guide will likely view that as obvious advice, as the light is always better early in the morning (or late in the afternoon). For regular visitors, it bears reiterating. 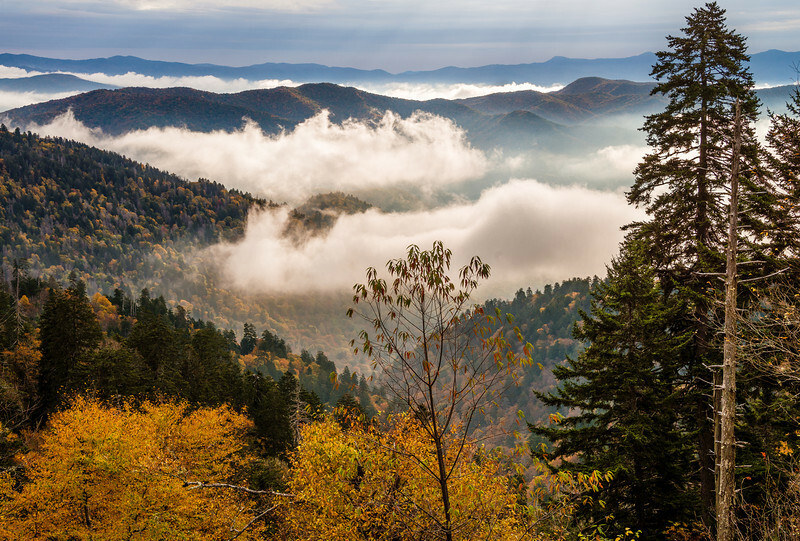 Because of Great Smoky Mountains National Park’s popularity, traffic to some areas, parking lots, and the areas themselves can be congested if you go at the wrong times. Getting up a few hours early is the difference between not dealing with any of that plus great photos, and being stuck in throngs of people stopping to take photos out of their car windows. Go to bed early if that’s what it takes to get up early. These photos of Great Smoky Mountains National Park were all shot with my Nikon D600 and Nikon 28-300mm Lens & Nikon 14-24mm f/2.8 Lens. To get some more Great Smoky Mountains National Park photo ideas, check out my Great Smoky Mountains National Park Photo Gallery. 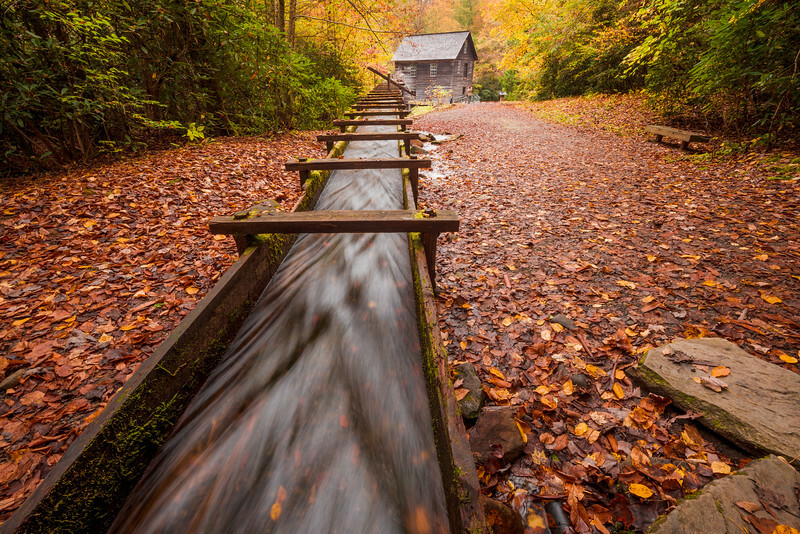 Where are your favorite places and things to do in Great Smoky Mountains National Park? Which of these would you most like to photograph? Any questions? Share any thoughts you have in the comments! Gatlinburg is basically surrounded by the park, and although very kitschy has a ton of places for families with kids to blow off some steam. Also saw Elk, about a dozen of them, outside of Cherokee near their visitor center. Never seen Elk up there before. It was amazing. And lots of wild turkeys too. Was just in the Smoky Mountains two weeks ago. Passed Mingus Mill many times. Asked my son if he wanted to stop, but we couldn’t decide. Now we will definitely stop. Was at New Found Gap many times. Couldn’t walk to Clingman’s Dome because of snow and it was closed until March 31st. Alum Cave Trail was always packed. Cars all over the road and parking area. We hiked up towards Laurel Falls half way, but due to wind and snow (23 degrees) we turned around. Drove towards Cade Cove, but the road seems to have gotten winder. So turned back. We were looking for more snow, but didn’t see much that way. Found a few nice water falls though. Roaring Fork Trail is always closed that time of the year too, but they did renovations recently so that is a great driving trail. Few places to park and walk too. We always stay at the Greystone Lodge on the river in a queen suite facing the river. It is next door to the aquarium. Just walk around Gatlinburg. The Village is great. Cute personal shops that are not chains. Pigeon Forge for junking out. Dollywood not worth the month any more. MagiQuest is amusing. Maggie Valley on the other side of the mountain is cute. Tube World and skiing. Harrods Casino is fun too in Cherokee. But all in all, I just love the snow. I lived in Pigeon Forge for two years and Cades Cove was one of our favorite places to visit. We often saw bears sitting/sleeping in the trees and the one way road allowed for many stops for scenic photographs, etc. One other attraction we enjoyed on a regular basis is DOLLYWOOD in Pigeon Forge. I would certainly recommend Dollywood. It is not your average theme park but allows access to beautiful Smokie mountain scenery and as a bonus, Dolly Parton often stops by. Thoroughly enjoy your regular updates Tom. Thank you. Thanks so much for the tips!! This has been on my list for awhile. I’m moving to Louisville (from Canada) so I’ll be much closer and hope to visit in the Spring! Do you have any suggestions on where to stay? Thanks Tom, I love your travel and Disney blogs and photographs. Where is a good place to stay with two kids (ages 8 & 5) when visiting the Great Smokey Mtns? Mt. Leconte Lodge is a cannot miss experience. It’s a hike in rustic Inn at 6400 ft. above sea level. The sunset views are astounding. Just south of the park the Cherohala Skyway between Robbinsville, NC and Tellico Plains, TN offers some incredible views too. Yes! Mingo Falls is an awesome spot! It took me a bit of effort to find because (for some reason) I thought it was on the Blue Ridge Parkway, but it was well worth it. Thanks for the tip! Add to that Tubing on Deep Creek at the Bryson City entrance to the park, rafting the Nantahala Gorge and of course the train in Bryson City followed by dinner at the Cork and Bean. Didn’t know that (actually had never even heard of a fenster)–it’s pretty awesome. Thanks! Never done that hike. I’ll have to write that down for my next trip (probably won’t be until the fall, but the colors should be great for it! ).